Well, I'm almost ready to blog about politics again. I think the election was a bit much - I got really stressed out about it, especially in the apocalyptic aftermath of the political commentary. Every time I vote, I always think about the Feminists (some might say FemiNazis) who have moved this country forward. They are responsible for giving me the right to vote, for blazing new career trails, for making more equitable laws, and so many other gains for the rights of women. 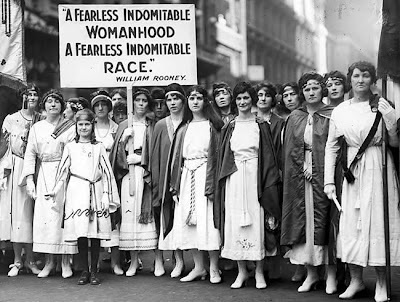 Fearless, indomitable - these are the adjectives I would apply to Feminists! Feminism is a word freighted with all kinds of connotations in Mormon culture. A Feminist can be viewed as someone who "hates men" or is a strident voice of discord in a society that values unity. Several years ago, a woman made a comment in church that "Ugh, I'm not a Feminist." Her tone made clear that Feminism was something dirty and terrible. I'm not an instigator, and I have no backbone so I didn't respond. But, of course, this comment hurt me - I don't think that my brand of feminism is everyone's cup of hot chocolate, but I do think that EVERY woman is a feminist (every man should be too, but that's another post). While driving someone to a far-away airport tonight, I got to hang out with a friend I haven't talked to in a while. She and I are polar opposites on the political spectrum, yet we both self describe as Feminists. Knowing this, I asked her to describe Feminism. She described a very different thing than my Feminism, but there was still the common thread that unites all of Feminism - the belief that women are equal to men in every respect. Equality is the heart of Feminism! As a Feminist once said, "Feminism is the radical idea that women are people too." Oftentimes we forget how RADICAL Susan B. Anthony and the early suffragettes were. Or how RADICAL it was to argue for women's education and employment. Or how property laws used to designate women as chattel. Feminism was a radical proposition when first introduced - almost laughable in its principles. Yet a group of very dedicated women fought long and hard to change unfair divorce and child custody laws, to remove barriers to women in college, and to establish my right to vote. Susan B. Anthony was even arrested for attempting to vote! In America! These lovely ladies were awesome! I am so grateful for them. While I don't think we're perfect in our equality of opportunity yet, we have come a long way, so I'm thankful for Susan and the girls who worked so hard for the generations to follow. We should be proud to take up their banner and advance the cause of women's rights into this 21st century. Susan's motto for "The Revolution," her weekly suffragette newsletter was "Men, their rights and nothing more; women, their rights and nothing less." Equal with thy brother, man. Light shall shine and darkness vanish. Love shall rein, oppression cease. Through long suff'ring worthy proved. When earth's curse shall be removed. Labels: Femme Fatale Feminist, Political Process, Thanks. Giving. Yay for feminists! I had never seen that hymn before, but I love it. Let's teach it to everyone at Thanksgiving dinner on Thursday. Ha! It is sad that feminists sometimes have such a bad reputation, especially in the church where many people are feminists (at least those that understand the doctrine) but just don't realize it. Hear hear! Reminds me of a great scene in Lincoln where a congressman who opposes the abolition of slavery starts listing the parade of horribles that the 13th Amendment will lead to: black men getting the vote! Intermarriage! WOMEN getting the vote! All of these possibilities are met with rousing disdain, even from many on the pro-abolition side. Carly: The tune is actually "Hope of Israel" - I think. We should sing it, ha ha! Austin: Thanks for the spoiler on Lincoln ;) I'm going to go see it tomorrow. Hopped over here from Anna Lewis' blog. I'm a 58-year-old who just recently woke up and realized that I've been a feminist all along. :) Some of us are late bloomers, I guess. Your hymn makes me grin. Thanks to Diana for putting the tune in my head. I want to march around the house, singing.